Maria Komodore starts off her San Francisco Bay Guardian overview of the career of Jean-Pierre Léaud with a perfect quote from critic Philippa Hawker who defines Léaud's acting style: "He is himself, he is his character Antoine Doinel, he is New Wave incarnate, he is the past-in-the-present, the past remembered and re-evaluated." Her overview is helpful in approaching the 13-film retrospective "Jean-Pierre Léaud: The New Wave and After" currently running at the Pacific Film Archives ("PFA") in Berkeley, California. 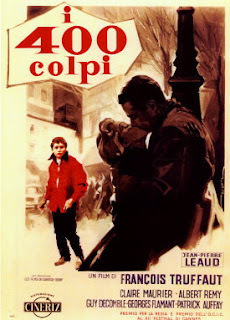 The series kicked off Friday, January 18, with François Truffaut's The 400 Blows (1959) introduced by Laura Truffaut, François Truffaut's daughter. She and her husband Steve Long, Berkeley residents, have been literally involved with PFA for decades and she agreed to provide introductory remarks. I was but a child when I started attending movies here [at the PFA]. Actually, I wasn't born yet when The 400 Blows was shot; I was born during the editing of The 400 Blows. So I wasn't really present on the set and don't have anecdotes for you. There's a very brief glimpse of my mother pregnant with me towards the end of the movie; but, that's the extent of my firsthand knowledge of how the filming, the editing and the release of the movie went. My father had made a short movie after several years as a film critic and that short movie Les Mistons  was professionally made. After that he felt really confident and ready to make his first movie. In Les Mistons he directed two young actors—Gérard Blain and Bernadette Lafont in her first role—and he directed five young kids, pre-teens, and discovered—to his surprise—that he really enjoyed directing them more than he enjoyed directing adults at that point. He figured out ways to have them be natural and to do things that worked better on screen. He really loved that part of the movie and he decided to have as his first movie a subject he had been thinking about. Originally that subject was called Antoine Runs Away. It was going to be a part of a movie composed of chapters, anecdotes about childhood. As he started working on it, he realized he had enough material to make a whole movie. He hired a screenwriter—Marcel Moussy—and together they worked on the script. Then they put an ad in François saying they were looking for a young boy aged 12 who wanted to be in the movies. 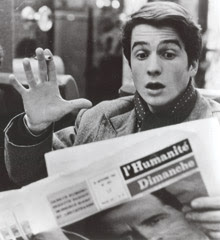 Several, many, young boys showed up—quite a few ended up being in the classroom scenes in the movie; one of them ended up again in a second movie, Shoot the Piano Player—but, from the beginning it was very apparent that Jean-Pierre Léaud was the one. If you have access to the Criterion box set of the Antoine Doinel movies, his screen test is included and it's just incredible. He's so full of life. He was 14, but he felt he was a young 14 and could play 12 with no problem. What he really wanted was to be in the movie. He brought a real joyfulness and a lot of character that really appealed to my father. 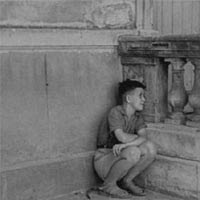 The 400 Blows was fairly autobiographical—much more than my father acknowledged when the movie came out—because he wanted to protect his parents to some extent. It was tricky casting an autobiographical movie and he loved, I think, the ways in which Jean-Pierre was different from him. Jean-Pierre was more extroverted. My father told me that, as a child, he was sneaky and secretive. I don't think he was the class clown the way Antoine Doinel can be. Thanks to Jean-Pierre, the character evolved and it allowed the story not to be plaintive or maudlin, which were concerns of my father with this material. There was no—well, not much—improvisation in the movie. 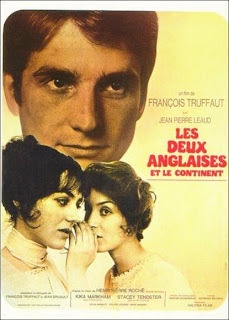 The gist of the dialogue was written but Jean-Pierre Léaud was free to use his own words. There's one scene in particular that feels completely improvised but really was not: the scene with the psychologist towards the end of The 400 Blows. My father and Jean-Pierre both knew this was a very important scene and they had a long time to prepare for it. My father just gave him the questions he was to be asked but then told him to come up moreorless with his own answers. That worked beautifully. You can really see how much of an actor this 14-year-old is. They didn't really anticipate going on with the Antoine Doinel character. That was never really thought, though Jean-Pierre was absolutely on his way to continue as an actor and he found several roles as a teenager and went on. But in about 1962, having made some other films, my father was asked if he wanted to participate in a collective movie called Love at Twenty with directors from various countries contributing a story of young people that [he felt] would be a good opportunity to [film] that character [again], not really at 20, but at 17-18 and how he lives independently. Again, the material was fairly autobiographical. He gave Antoine Doinel a passion. My father at 16-17 spent his life in the movie theatre at the Cinémathèque and at debates on film. That's really all he did. He was trying to make a living somehow. So he gave Antoine Doinel a passion for classical music. He goes to concerts. He goes to lectures about classical music. It's interesting that he brought that into Antoine Doinel's adventures. 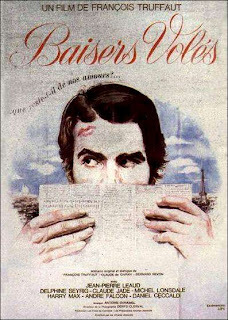 As they went on then with Stolen Kisses , which was planned, and Bed and Board  also a few years later in the early '70s, there were more and more similarities between Antoine Doinel and my father that developed. Neither of them were very modern. They're a little old-fashioned. They're definitely not trendy. They don't go on vacations. They don't swim. They don't use Kleenex to blow their nose. They're not terribly faithful. Family life had its issues for them. But, then again, there was a big difference that started appearing that made it hard to go on as you see, to some extent, in Stolen Kisses but more in Bed and Board and the last one in the series, Love On the Run , which is that Antoine Doinel is always kind of starting adult life. He doesn't really have a career. He has very funny jobs that last for a while then peter out. In Stolen Kisses he works for a while as a detective. This was a great way to have supporting characters and supporting stories be more important compared to the earlier Antoine Doinel films. In Bed and Board he has a job for a while in a miniature harbor with miniature boats that he activates with a remote control. I've never met anybody that has a job like that; but, I can tell you that there are five or six movies of my father's where this is what the protagonist does for a living. Miniature boats, miniature planes. That was for two reasons. First, what [my father] loved was movies. He couldn't imagine what a real job would feel like or look like and, obviously, sitting at a desk or traveling with a briefcase through the airports of the world wasn't visually appealing. There were advantages to those [imaginary] jobs and also those jobs feel like play and that's really I think the only way [my father] could imagine somebody making a living happily was doing something that felt like play. 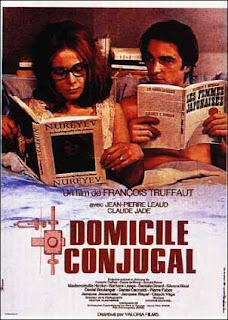 But that proved to be a problem for Antoine Doinel. He's so charming. He's an eternal adolescent; but, how long are we going to be patient with him trying to find himself and not quite succeeding? He's not an artist. He's not somebody who feels confidence in what he does. That really got to be difficult. In the late '70s there was really no plan to go further with Antoine Doinel; but, my father realized he had all this material. It was really unique; a character who grows up on film from the age of 14 to 30. 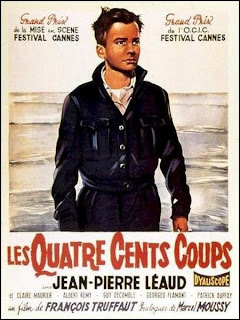 There was all this material and he thought it might be nice and an interesting challenge to mix it, to do 45 minutes of new material mixed in with flashbacks and find a way to weave it into an interesting narrative and to maybe put Antoine Doinel in a new direction; maybe put him into adulthood at last. It was really a challenge and difficult and, of course in the meanwhile, Jean-Pierre Léaud—as this retrospective is going to show—was doing a lot of other movies with a lot of other directors. He was always, at the same time, very modern. There are not too many Léaud movies where he's wearing a costume. In the series I think there are maybe just a couple: Two English Girls  being one of them. My father was more interested in casting him in different roles, moving away from Antoine Doinel. [Léaud] is an interesting and intriguing actor. Now there's a new generation of young French actors who clearly model themselves after Léaud, after the persona of his movies from the late '60s and early '70s that's very perceptible. I just want to add one purist fact. 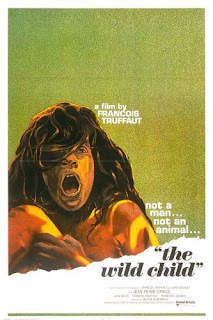 My father dedicated The Wild Child —a very different film of his—to Jean-Pierre Léaud. They were always very close and I think it was very clear to my father that there were strong echoes, personally for him, in this very different story of The Wild Child; a fairly isolated child who is brought up and given a lot of attention and educated by his mentor. 2008 OSCARS—On Your Mark Red Ribbon Runners!! VAL LEWTON BLOGATHON—It's A Wrap! !